The Midwest Life Stages Metal Dog Crate Review is nearly 11 years in the making. In fact it’s my first puppy product purchase ever! Flashback to January 7th, 2005: The day I picked up Linus from the Carson Animal Shelter. I began my search for a puppy on December 5th, 2004 and after browsing PetFinder.com I came across an Australian Shepherd/Labrador Retriever mixed puppy with a white spot on his chest. Little did I know that this little puppy would be my best friend for the next 10+ years. What does all of this backstory have to do with a MidWest Life Stages Double-Door Folding Metal Dog Crate? (affiliate link) Well, after I decided Linus was the puppy for me I ran over to the local PetSmart to purchase all of the essential supplies for my first puppy. I wanted to crate train my puppy so one of my purchases would end up being the MidWest Life Stages Dog Crate (affiliate link) and the only item from that day that I still use to this very day. In fact, Linus will still meander into his crate on the off day we do not have a puppy in training. Whether starting with a new puppy or starting again with an adult dog, this folding double-door metal dog crate cuts housebreaking time in half and reduces behavioral problems. The exceptionally versatile unit features a divider panel that allows for adjusting the length of the living area. Keeping the living space small enough reduces the chance of the puppy eliminating in one end and sleeping in the other. Choose the size of crate that the dog will need when it reaches its full adult size, as the divider can be adjusted as the puppy grows. For easy placement in an automobile or in the corner of a room, the dog crate also comes equipped with convenient double doors, which allow both side and front access. Other highlights include safe and secure slide-bolt latches, a durable satin-black electro-coat finish, 1-1/2-by-5-7/8-inch mesh, rounded corners, and two plastic handles for carrying. The unit easily sets up and folds down to a portable size for suitcase-style carrying, and an ABS-composite plastic pan for easy clean up comes included. The dog crate carries a one-year limited warranty. It’s interesting to read such polarizing reviews about the same product. It’s important to read as much as possible about anything you are looking to purchase whether it be for you or your dog. Even more interesting is I’ve had 10 years of experience with this product and seeing that I’ve continued to use the MidWest Life Stages Dog Crate (affiliate link) I bet you can guess which camp my review will fall in. Since picking up Linus 10+ years ago I’ve only had one crate until recently (I bought a second Midwest Life Stages Dog Crate) and that one crate is the MidWest Life Stages Dog Crate (affiliate link). During those 10+ years I’ve probably had over 100 dogs use the same crate! That’s right…OVER 100 DOGS!!! Yes, the crate has rusted from a time when one of the puppies was trying to chew on the metal wires, but besides that it’s been plenty durable. I’ve been a guide and service dog puppy raisers for the better part of the past 10 years and the majority of the puppies and dogs that come through our house are Labs and Goldens although we do foster mixed breed dogs from a local rescue from time to time. This crate is collapsible making it easy to store and transport. The plastic tray is removable and easy to clean if you happen to have a mess in your crate. Because it’s a wire crate it is breathable. Air is allowed to flow through the crate. It’s been very durable for me, but check customer reviews on Amazon.com (affiliate link) as others have found it not well made. Our crate has some rust on it, but it doesn’t bother me or the pups. When using the crate with my young pups I have had one or two get their paw caught up between the wires. While they have been able to quickly remove their paws they did let out little squeals. This could probably be remedied by buying a smaller version of the same crate for my pups and something I may do in the near future. While others have brought up some major issues with their dogs and this crate I have not had any real problems with our Life Stages dog crate. However, I can see how some exceptional dogs may escape, destroy, or have issues with this crate and for that matter any crate. I’ve even had friend’s dog chew through a plastic crate in attempt to escape! So that’s it folks! Do you crate train your puppies and if so what type of crate do you use? Tell us about it in the comment section below. I LOVE these crates. I’ve done rescue and foster for over 10 years, had many types of crates, but these are without fail my favorite. I never found the escape nor rust problem noticed in the 1-2 star reviews (so glad yo u look at them, too: I recently learned to check there first when looking at a new product). I found this crate best for when I had a pair of foster/adoptable puppies. Large enough to give them a bedroom with a very small airline crate, a pee pad, with their food/water in the front. The versatility of the two doors is terrific. I”m glad you’ve had good experience (10 years with so many dogs!). I gave mine away (sigh) but when next I buy a crate, it will be the Midwest LifeStages Dog Crate. Thank you for an informative review. Yep, I haven’t had the problems people talked about in the 1-2 star reviews on Amazon, but I could see it being a problem if your puppy was an escape artist. Speaking of rescue and foster I remember years ago bringing home a litter of 7 German Shepherd mix puppies from the shelter in the very same crate I still have next to my bed. Thanks for stopping by and sharing your story. What is important is that if you crate train, that there is enough room to move around. It is heartbreaking to see a dog stuffed in a cage! The size of the crate is very important. 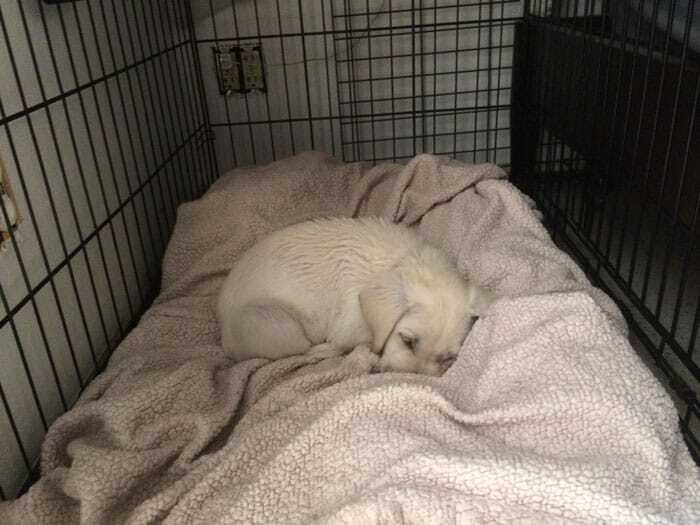 When we crate train our puppies the crate shouldn’t be too small or too large. If it’s too large then a puppy will tend to sleep on one side and potty on the other. Here’s and article we wrote on crate training puppies: https://puppyintraining.com/crate-training-puppies/. Thanks for stopping by!